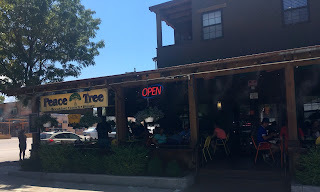 On my most recent visit to Moab, Utah, the beautiful land of red rock mesas, I decided to give Peace Tree another try. As a very hippie-ish cafe, I feel drawn to it and I wanted to try some of their other vegan offerings. So, I went several times. 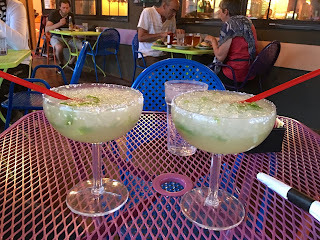 On our first visit, we started with jalapeno margaritas--fantastic! 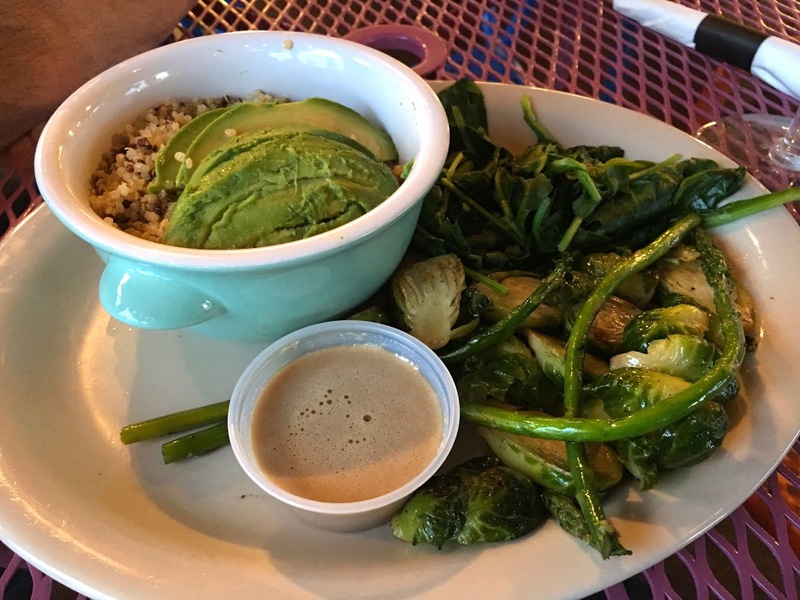 We weren't that hungry so we shared the Quinoa Bowl with Avocado. Served with brussels sprouts, sautéed spinach and a tahini sauce, it was pretty good. It was much smaller than we though it would be for $15, but it was still good. 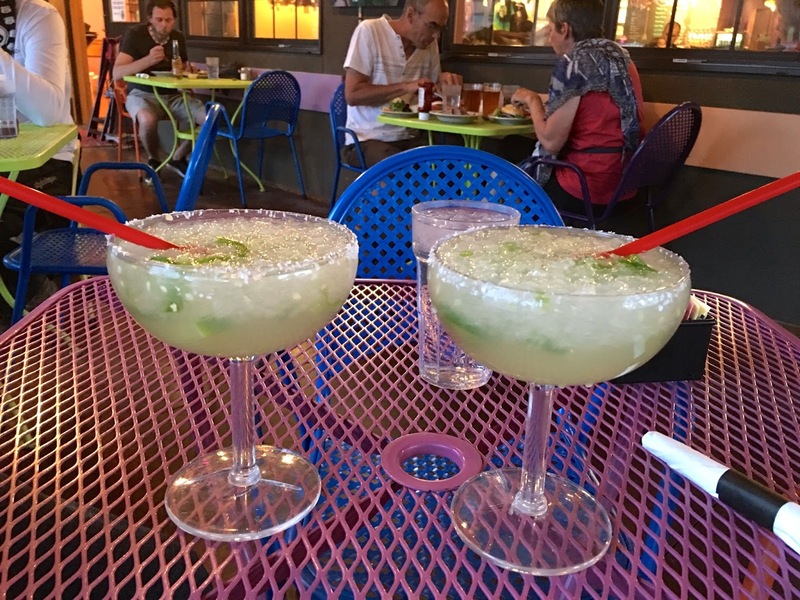 On our next visit, again, the jalapeno margaritas because they are yum. 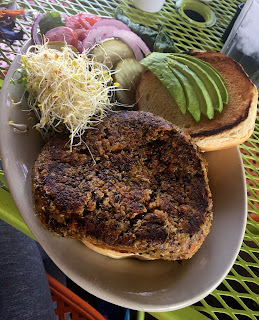 This time, I tried the Veggie Burger made with quinoa, brown rice, and roasted vegetables served on a bun branded with the Peace Tree logo and topped with sprouts and avocado ($12). This burger was huge! It was really good, but it completely fell apart as we started eating it. And it was so large that I had should have cut it in half instead of eating the whole thing and feeling like I shouldn't have later! But, it was soooo good! It came with a side salad too. Highly recommended. 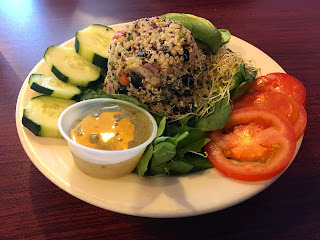 On our third visit, I wanted something really basic so I ordered the Quinoa Salad. This quinoa salad was made with red onions, green peppers, tomatoes, and black beans tossed with olive oil, parsley, and lime on a bed of spinach surrounded by tomato, cucumber, and sprouts. And I added avocado. Honestly, I think it would have been a good salad, but it tasted like it might have been going a bit bad. I still ate it, but the beans had a funky taste to them. It was okay, but nothing special. So, after three more meals here, I have to say that some of their food is really good. The jalapeno margarita and the quinoa burger are a must-try! And the quinoa bowl is good too! So, a bit of hit or miss, but all in all, a great staple in Moab.